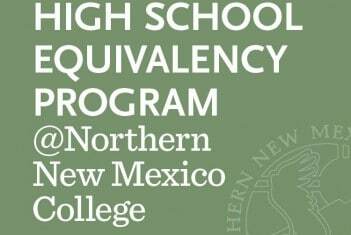 Northern New Mexico College’s High School Equivalency Program (HEP) has been ranked the best in the nation for 2016, according to a newly released report by the Department of Education. Northern’s HEP achieved a 96 percent graduation rate, the highest among the 43 High School Equivalency Programs operating nation-wide. The national average for graduation from HEP is 68 percent. The program has also excelled with 96 percent of graduates entering postsecondary education or training, upgraded employment, or the military. The national average is 81 percent. “Being number one against all these institutions that have huge amounts of resources is simply incredible. I am so lucky and privileged to be part of our students’ journey and success, and to have the opportunity to give back to the community that gave me so much” said Shari Jobe, Director of the High School Equivalency Program. “We owe our success to our extremely hardworking students, our dedicated and compassionate staff who provide a home for the students, and to the constant support we receive from the College,” Jobe added. HEP is a federally funded program that helps migratory and seasonal farmworkers or their immediate family, who are 16 or older and not currently enrolled in school, to obtain the equivalent of a high school diploma. Northern’s HEP serves 80 students a year who seek to attain their High School Equivalency Credential (HSE) after having their education disrupted for a variety of reasons. Students go through an 8-week intensive course where they study math, reading, writing, social studies and science, before taking the HiSET exam, a rigorous test that 70 percent of graduating high school seniors cannot pass. Students also undergo a 2-week college and career transition course where they practice writing resumes and college applications, applying for grants and financial aid, and conduct mock interviews. “I am extremely proud of our HEP team who have done an incredible job with the students. HEP is a program that transforms lives and this result demonstrates the value of Northern New Mexico College in this community,” said Dr. Ivan Lopez, Provost and Vice President for Academic Affairs. “This is an incentive for the rest of the College to continue its hard work in service to our students and community,” Dr. Lopez added. “They are the reason this program is so successful. They give their hearts and passion to the program, and our students know they are in good hands. It just doesn't get any better than that. I am more proud of them than I can say," Dr. Bailey added.